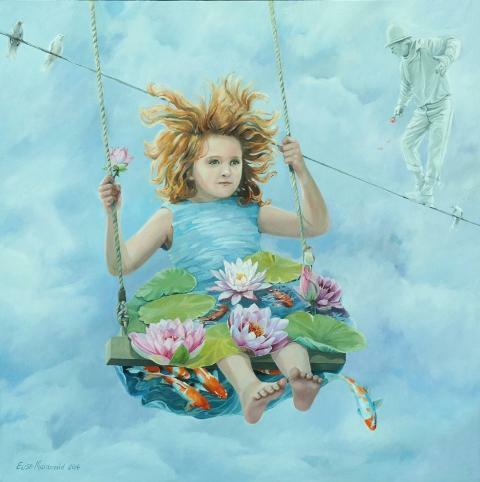 Best described as 'magical realism', Elise Macdonald's oil paintings are rich in imagination. "Painting has been described as 'poetry without words'. I prefer to say 'every picture tells a story'. There is a narrative element in all my paintings and the viewer is invited to enter the realm of their imagination where multiple realities co-exist; worlds within worlds. Figures, flowers and birds are depicted realistically but in a fantastical situation, transformed into stories of innocence and beauty, especially evoking the idea of freedom. My process is slow with meticulous attention to detail as I build up layer upon layer of paint. And finally, to paraphrase Leonardo da Vinci, my paintings are never finished, they are abandoned." 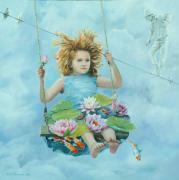 Elise Macdonald has a BA(Fine Art) from Wits University. In 1982 she had a sell-out exhibition at Crake Gallery in Johannesburg. Thereafter she exhibited at the Everard Read Gallery in several group shows. 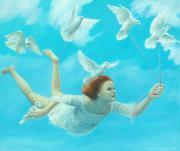 After moving to Knysna in 1996 her work was shown at Trent Read's Knysna Fine Art gallery. However during this period her art output dwindled as she focused her attention on her family and establishing a career as a freelance writer. In recent years, as the nest emptied, her passion for painting re-ignited and she has been selling work to international as well as local buyers.